I had posted earlier about my Erin Condren Life Planner and wanted to share a little more about some of the things I was curious about before I ordered mine. I hope this information is helpful for others! I had a slight issue with my Erin Condren Life Planner but it was very minor and still functional but my OCD tendancies made me have a minor freak-out about it. Their website had recently been hacked and fortunately for me, my planner was already in process and printed when this happened. I can only imagine what their customer service group was dealing with since many orders were lost but they handled the situation so well and have since recovered. I felt bad about contacting them but after a tweet response from Erin herself advising me to contact them, I did! Erin and her company strive for absolute customer satisfaction and they went above and beyond for me! They are awesome!! On Friday I contacted customer service and by the following Wednesday I had received FedEx Express shipment from Erin Condren that resolved my issue! Plus they included extras for me in my email communications and in my shipment. Wow! Not many companies are as responsive and so rapid, even while dealing with trying to catchup and recover following their website hack! 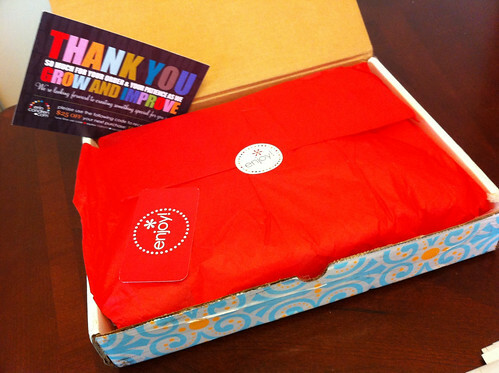 Once again, they shipped my package in a beautiful box with bubble wrap and tissue! They get an A+ for presentation!! So on to more details about my Life Planner... The planner is thick! It's over an inch! 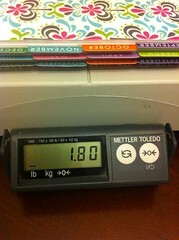 I weighed my planner just as it arrived in the box with no extras of my own added to the folders. So this includes the three clips plus extra stickers and cards on my work shipping scale and it came out to be 1.8 pounds. Yes, it's got a bit of weight to it. Keep in mind that this includes not only all twelve months of 2012, but also includes five extra months of August through December of 2011. I'm sure it would be much thinner if it only included the months of 2012, so this is something to consider if you've already got a planner for the rest of this year or want to wait to start it next year. One of the best things about Erin Condren's site is that they allow for customization and you can ask for it to only include 2012. 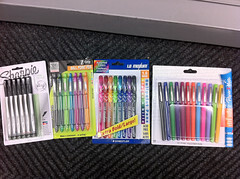 Not only am I obsessed with planners and calendars, I also have an obsession with writing utensils. So I had to find the perfect pens to use with my new Life Planner. After I had ordered my Life Planner I had two weeks before it arrived, so that's when I went on my quest for the perfect pens. Wow, there are a lot of pens out there - too many to choose from! This is just a small selection of what I found at my local Staples store and I left without making a decision. 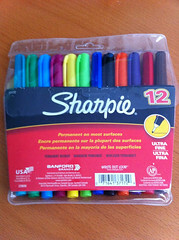 I had received a tweet from Erin that they like to use fine-tipped Sharpies and roller ball pens. My wonderful Hubby bought me a package of Ultra Fine Sharpies and surprised me with them the day after I had received my new planner (yes, he's great and supports my obsessions). I was so excited to start filling in the pages of my planner, but much to my dismay I discovered that the Sharpie markers bleed through the pages! But they work great on the stickers included with the planner, so I'll reserve use of them on the stickers only. I had a $5 coupon for Staples so I made a quick trip to pickup some pens! Once again I was faced with the options from earlier and I had to make a decision because I coulnd't wait any longer to start using my planner. I came home with these uni-ball 207 gel pens with 0.7mm tips and so far they've worked out great - they do not bleed at all! I gotta say... I'm very impressed with Erin Condren's Life Planner and especially with her Customer Service group! My obsession with her products will surely grow and I know I'll be placing an order for more products very soon! 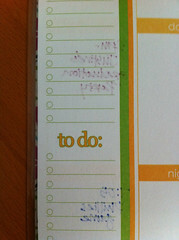 Do you also have an Erin Condren Life Planner? What kind of pens do you use with it? I just got my life planner and I'm having issues finding the right pen :( unfortunately I tried a few in my September section and I just don't feel like any of them are "right". Which pen(s) did you finally decide were the best for the planner in your opinion? I used the Pilot G-2 gel pens on mine. I'm not in love with them, but I like how they write usually, I just have to make sure I give it a chance to dry. My OCD would freak if I smeared the calendar!!! I use the Sharpie PENS....not the fine tip markers and they work great. You can highlight over them and they do not bleed either. 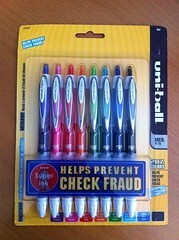 @Yadie - I've ended up using the colorful Uniball pens for now. I don't love the way they write and I'm still in search of the perfect pens to use. I use Sharpie markers on the sticker/labels. I think they have horrible customer service. Multiple phone calls and emails get me no more information than "in Production." So much for paying for priority processing... How can they know nothing about their own orders1!?!?!?!? 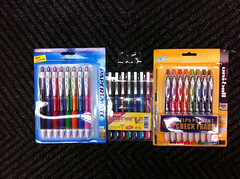 Any suggestions for the dry erase pens? I find they bleed from the dry board cards onto my regular pages...thanks!